Air tanker 944 Just rolled into McClellan. now at Cal Fire Hangar. 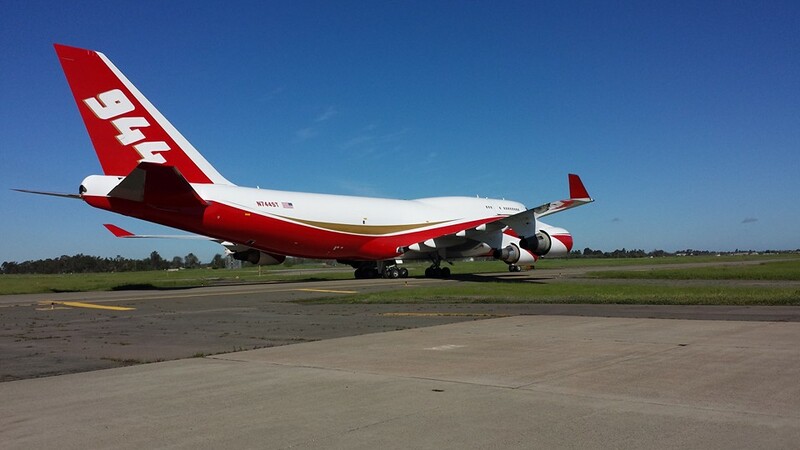 The 747 SuperTanker arrived at McClellan Air Field in Sacramento today from Marana, Arizona after a gorgeous new paint job. Bob Soelberg, Senior VP and Program Manager of Global Supertaker, said the retardant delivery system still needs a few tweaks before it can actually drop water or retardant, but they hope to have it ready to fight fire later this year. The wildfire season in North America has been a challenging one for all concerned. According to the National Interagency Fire Centre, 6,224,545 acres had been burned by a total of 37,894 fires by 8th August, the second highest in the last decade with the fire season still at National Preparedness Level 4, the second highest level. It is against this backdrop that the 13th Aerial Firefighting International conference has been officially announced by Tangent Link and will take place during March 2016, returning to its recent US home of Sacramento in California. Tangent Link has a long-standing commitment to the international aerial firefighting community in the way it has continually brought together governing bodies, institutions and associations, as well as operators and those who are tasked with overcoming wildfires. Over the two days of conference in March 2016, delegates will hear from several invited US Senators and international aerial firefighting specialists. The session programme will include presentations on the following issues: civil and military firefighting operations, both nationally and globally; an examination of the latest developments in night vision techniques and the increasing use of unmanned systems; together with an examine of future technologies. At the conference dinner, The Walt Darran International Aerial Firefighting Award will be presented to recognise the contribution of an individual or organisation who have been judged by a panel of experts to have made a significant contribution to aerial firefighting. There will be external live demonstrations of aircraft and fire fighting equipment, together with static displays.